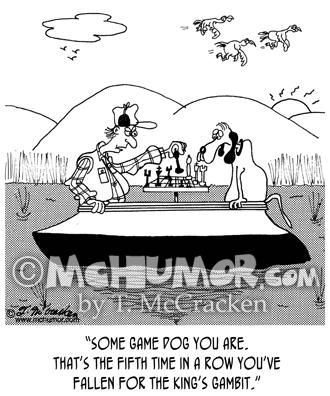 Dog Cartoon 4910: A hunter playing chess in a boat with a dog and saying, "Some game dog you are. 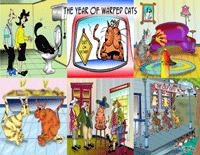 That's the fifth time in a row you've fallen for the King's Gambit." 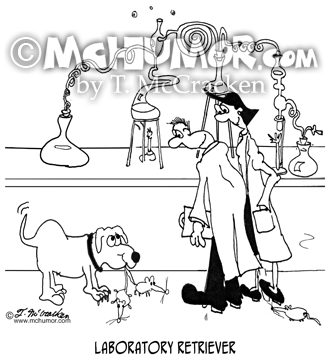 Dog Cartoon 8485: "When the breeder sold Steve a great game dog, he didn't mention that the dog's great game was on-line poker." 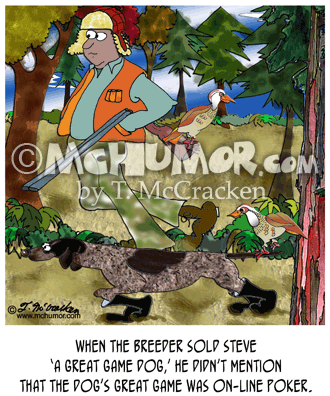 A hunter's dog doesn't even notice it has a pheasant on his tail. 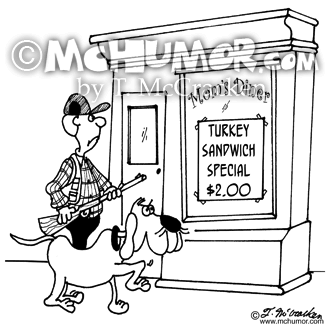 Hunting Cartoon 4183: A hunting bird dog points to a cafe, "Mom's Diner, Turkey Sandwich Special, $2.00." 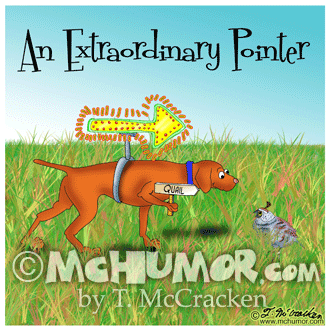 Dog Cartoon 8733: "An Extraordinary Pointer." A dog with a neon arrow on its back points to a quail. 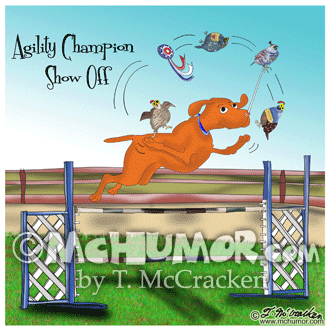 Dog Cartoon 8732: "Agility Champion Show Off." A dog jumps over a fence while juggling quail. 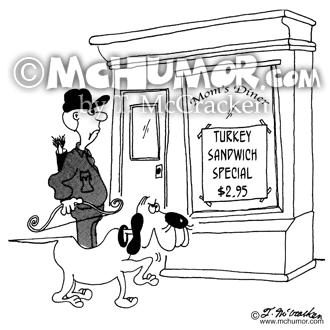 Hunting Cartoon 5212: Bow hunter's dog pointing to a diner advertising, "Mom's Turkey Sandwich Special, $2.95." 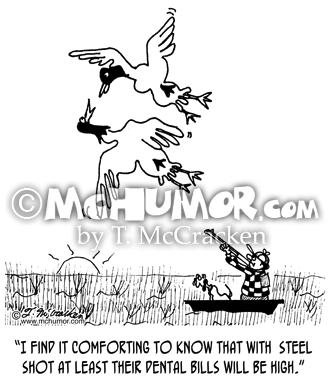 Hunting Cartoon 4208: A duck near a hunter says to other ducks, "What I'm really looking for is a kamikaze volunteer." 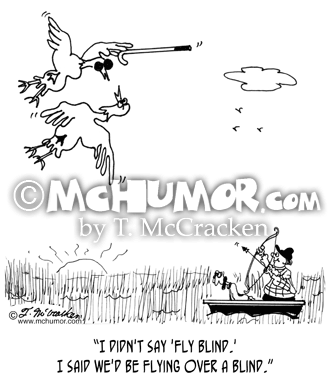 Blind Cartoon 5350: Duck to another with a cane and dark glasses flying over a hunter, "I didn't say 'fly blind.' 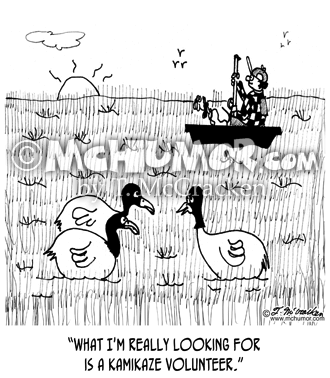 I said we'd be flying over a blind." 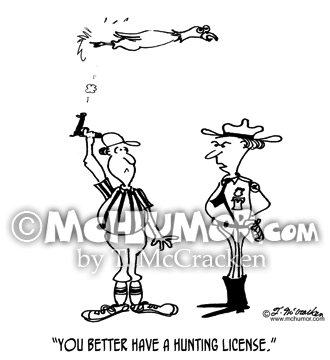 Hunting Cartoon 4198: A duck flying over a hunter says, "I find it comforting to know that with steel shot at least their dental bills will be high." 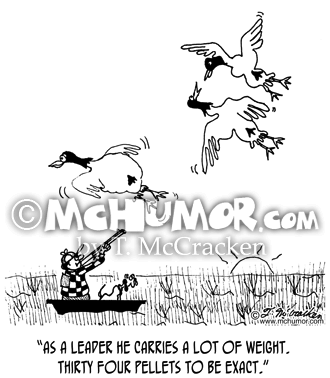 Hunting Cartoon 4199: A goose flying over a hunter says of another bird, "As a leader he carries a lot of weight. Thirty four pellets to be exact."